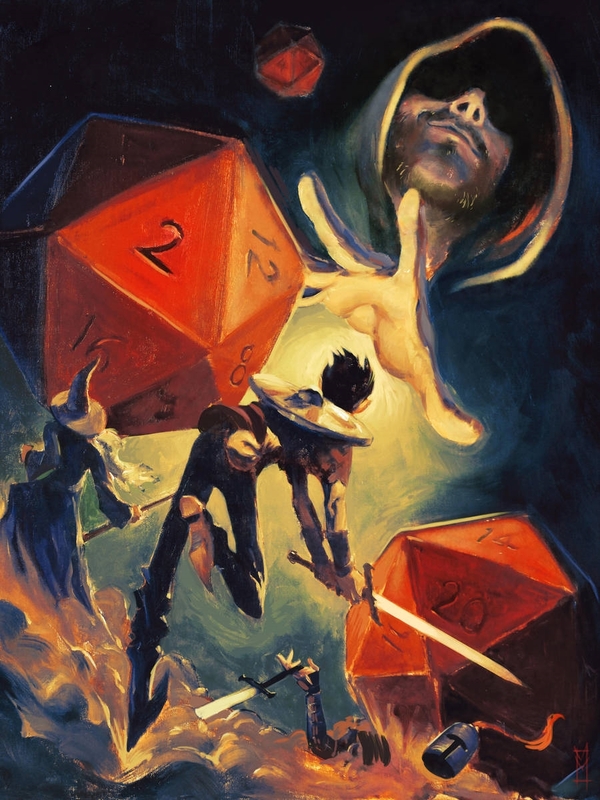 The Dungeon Master, by Victor Maury. Click here for more of the artist’s work! Ne definition to “Golem stomps on the knight’s head to make sure you’re dead.” lol. I wanted to do a version of a “transported to another world” story where it is the dungeon master of a particularly cruel game he or she designed in an effort to say that life is only ever tragic. He or she would have to live with that reality, the darkness, the monsters. And come to realize that the meaning in life, (through her wanting to use her DM knowledge to help the people that helped her get on her feet in the new world) might just be the wanting to help each other amidst all the unfairness… I wonder if that could be any good. Some one with talent should pick that up. lol. I have a vaguely similar idea about a group of middle aged gamers reuniting for a high school reunion and finishing the last D&D adventure they were playing before graduation. They get sucked into the game world, gain new bodies but keep their memories, and their old characters are the villains. They see all their old actions in a horrible new light, and band together to stop them. I came up with the idea after realizing years after high school that most of our “heroic” parties of adventurers were actually HORRIBLE, greedy, manipulative, violent, power hungry ASSHOLES. Not the kind of people you’d want to know or be around by choice in the real world at all. I wonder if it’s possible to introduce both of these themes to an idea. Because I’ve basically outlined a similar attitude to the Dungeon master. A story where the Dm is a kind of fallen god that faces his terrible decisions in world building (his nihilistic outlook), and the characters must face their old heroes at the same time. Helping each other overcome their own tendencies, their folly filled youth mirrored in the actions their heroes acted out. I think it could be a good story. Though it would require a complex mind to do well enough that the apparent simple (into another world) story doesn’t undermine the sort of middle aged wizening that the characters would go through.